Don't forget the HST would also apply to things like labor for any work done on your car. Sounds like right now may be the perfect time to buy a new bike! So please take the time to visit the Squeaky Wheels BLOG to sign the petition. Or you can do the same through the British Columbia NDP's online petition. Many of you have recently received an email from me via Facebook but I want to make sure you all get this. 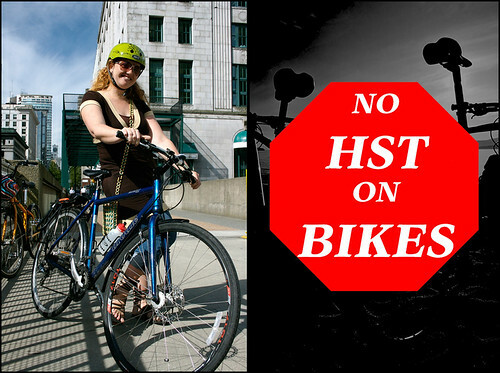 I’m very happy to write that today the “No HST on Bikes in BC” petition reached 1800 online signatures and about another 350 have been faxed in! Dozens of new signatures are coming in daily. I’m even more excited to tell you that we are planning a big rally on Wednesday March 3, 12pm, at the Legislature! Both Finance Minister Colin Hansen and Minister of Small Business Iain Black declined to meet with me to discuss their plans to increase taxes on cycling: I need your help to get their attention. Let's fill the Legislature grounds with cyclists and show this government there will be a political price to pay if they ram through a new tax on cycling! The next session of the BC Legislature will begin the 1st week of March. I believe the government will likely try to rush the HST into law this spring. They promised to implement it by July. As you know, if it passes as is, you will be paying 7% more tax on a bicycle purchased in BC. This is more tax than you have paid in almost 30 years. You’ll also have to pay 7% more for stuff like helmets and locks, as well as paying 7% more for repairs. The Liberal Government has got its head in the sand. Cycling is a healthy and sustainable transportation choice and should be encouraged, not punished with new taxes. Cycling is excellent physical activity: it helps you stay in good shape. That saves everyone healthcare dollars. And cycling is good for the environment. Approximately 40% of emissions in BC come from transportation. Global warming is a crisis: creating disincentives for cycling is unacceptable! It is not too late for them to correct this mistake. It is critical the BC Government hears from all of you! And 1000 bikes on the lawn of the legislature will get this government's attention! March 3rd will also be the day that I will present the petition to the Legislature. We’ve got more than 2000 signatures, but I want to increase that tenfold before the rally! I know most of you have already signed and promoted the petition but please keep it up! The petition is at www.squeakywheels.ca. My hope is that bike shops, cycling associations and cycling enthusiasts all over BC will help me organize a critical mass at the legislature on Wednesday March 3. Thank you! We’re doing up posters, handbills and buttons and I can get those to you shortly if you want to help. Visit the facebook event page to RSVP and network.